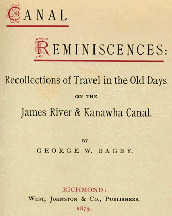 George William Bagby, 1828-1883 Canal Reminiscences: Recollections of Travel in the Old Days on the James River & Kanawha Canal. Richmond: West, Johnston & Co., 1879. James River and Kanawha Canal -- Navigation.